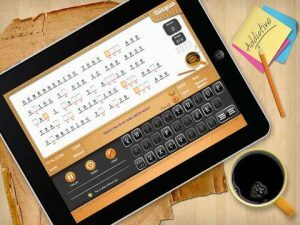 Developed by Thinknao software, Quoth HD is a addictive word puzzler for both iPhone and iPad. A free download, Quoth HD takes its own spin on the guess-a-letter Wheel of Fortune-style game mechanic where the key is to discover well-known or famous hidden quotes and sayings. Quoth HD features quotes from famous individuals such as Mark Twain, Benjamin Franklin and Steve Jobs as well as categories such as Sports and Movies, and with over 10,000 quotes in total Quoth HD provides an almost never-ending challenge. Some quotes you will know off-the-bat but many will leave you scratching your head in search of the answer. O_ly _hos_ who ar_ asl__p mak_ no mis_ak_s. At the beginning of each game you’re given very few starting letters to work with. Your first move is to guess the highlighted square to reveal the underlying letter. To do this you simply tap the correct letter on the underlying keyboard. If you got it right, all instances of that particular letter in the current puzzle will be revealed and you’ll move on to the next highlighted letter. If you get it wrong, you can choose again, but you lose points for every incorrect attempt. Every correct answer you get fills out the missing words and makes the next letter that much easier to figure out. Quoth HD is fully GameCenter enabled and features an in-game ranking system as well as multiple difficulty levels to suit all ages and ability levels. Bottom Line: A word-based puzzle game that provides hours of replayability for free, Quoth HD is most definitely worth a look. Quoth HD is compatible with iPad. Requires iOS 5.0 or later. A small fee was paid by the developer to expedite the review of this app.